Our programme starts at Parliament Square where we see plenty of action with the sightseeing buses running alongside the Routemasters and Metrobuses in normal service. We then move to Islington and then visit Potters Bar garage to see RMs from the training fleet parked up alongside former West Midlands Volvo Ailsas. Victoria is our next location with the busy bus station and surrounding streets providing most of the action. Look out for RM89 (VLT 89) looking resplendent in ‘General’ livery. At Trafalgar Square we catch up with former RMCs on the 15 and X15 service before we visit Whitehall, Oxford Street and Hyde Park Corner to see the Routemasters doing what they do best – moving people! Malcolm then turns his attentions to the sightseeing RMs. On this programme the name has changed to ‘The Original London Transport Sightseeing Tour’ due to the competition now offered by companies such as ‘Cityrama’ and ‘London Pride’. We start with Tower Bridge and see a former West Yorkshire Bristol VRT plying its trade with an ex London Transport DMS, as well as LT’s own Routemasters. We then move onto London Bridge and see the newly introduced extended open top Routemaster – the ERM – running across the bridge. After some night filming in the St Paul’s Cathedral area we return to London Bridge to capture more action of bus traffic on the bridge. Again more ERMs and RMAs are recorded for you to enjoy before a return visit to Victoria. Malcolm then features former RMA2 (KGJ 602D) running with Green Rover on a special duty at Victoria along with former RM1975 (ALD 975B). We take a short ride on the RMA offering an interesting comparison with the standard RM/RML we are used to. We also see preserved RLH23 (MXX 223) running a similar duty. Our next feature is a visit to the North Weald bus rally on the 19th July 1988. Here Malcolm has captured the use of an RMA, RM and DMSs from the training fleet as a ‘drive a bus’ feature as well as a good number of preserved Routemasters. 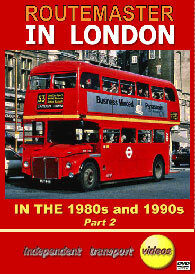 The final scenes on this programme are of Routemasters being scrapped at the end of their days in London. They were filmed in a Barnsley scrap yard during 1987. It is pleasing to know that a good number of Routemasters have escaped this fate and are now preserved and still operated for generations to come. …….So take your seat and enjoy this nostalgic video presentation featuring the iconic Routemaster running in service in it’s natural home - London!